A one or two day inland rideway route which is also part of the South West Coast Path trail. Gives the option to head onto the South Dorset Ridgeway from West Bexington or Abbotsbury to enjoy some inland walking and views instead of taking the usual coastal option through Portland and Weymouth. Formally known as the Inland Coast Path and now as the South Dorset Ridgeway this is a superb route in its own right following the high ground on a crest of hills above the coast. These days with the addition of the superb Isle of Portland to the coastal route, the argument for using the Dorset Ridgeway to miss out a dull section at Weymouth is no longer that valid. However, it will suit those short on time by saving a days walking OR suit those who want to vary the South West Coast Path route walking with some inland ridge trail. Those who take the option will enjoy panoramic views of the Dorset Downs and Coast from up high on paths straddling ridges and crossing hidden valley’s linking a huge number of archaeological sites and monuments. Whilst it is possible to split the walk into two days by coming down off the South Dorset Ridgeway to overnight, those walking it in one go need to be prepared as there are no facilities on the route itself. After leaving the SouthWest Coast Path to the perils of Chesil Beach at West Bexington a gentle climb inland on stony paths takes the Dorset Ridgeway through the gorse bushes of Limekiln Hill and the National Trust restored stone limekiln. 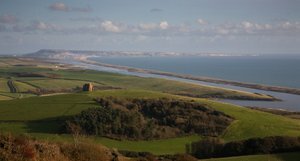 Fine views of Chesil Bank, the Isle of Portland, Weymouth and the inland Hardy Monument spur you on to the impressive earthworks and well preserved ramparts of the rather imposing Abbotsbury Castle Hill Fort. This spot also used by the Romans as a signal station. Abbotsbury looks very inviting from up here ¾ mile above the South West Coast Path route and if you don’t visit fear not as the main Tythe Barn, strip farming patterns and Church are all visible from up on the ridge. A section of archaeological treasures follow starting with the run of Tumuli and barrows at Weares Hill and then a small ritual stone circle at Evershot Farm which was only excavated in 1965 the stones having stood since 1200BC. Next up is the locally well known “Hell Stone or Stone of the Dead”, an impressive prehistoric stone barrow or Dolmen said to have been thrown here by the Devil from Portland Isle. Partially reconstructed after it collapsed, the large original burial chamber which is covered by a single capstone can be entered. Back on the South Dorset Ridgeway watch out for brown hares and roe deer as you climb through a mix of pleasant woodland, heather, and gorse slopes topping out at the head of the ridge at a 70’ high gothic tower built in honour of Lord Nelsons Captain, Thomas Masterman Hardy who lived below at Portesham. 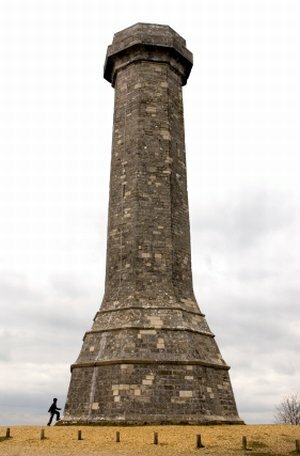 This is the Hardy’s Monument visible from all over this part of the coast and needless to say the views are superb from up here. After entering the forest of Black Down you hit a section of superb high Ridgeway through the grassy Tumuli along Bronkham Hill. The greatest concentration of Bronze Age Barrows in the UK lies here, a favoured spot for the TV Timeteam Archeological Team and you will pass over more than 150 Barrows on this section. On the hillside to the north you will also see the huge earthworks of Maiden Castle, Europe’s biggest covering over 50 acres, its ramparts over 20m high. The fort housed several thousand in its heyday and can be reached around 1 mile north of the Dorset Ridgeway route. Those splitting the Ridgway route into short sections will now descend from the ridge to the village of Upwey with its famous wishing well to stay overnight before climbing back next morning to continue along the route. Descending steadily you pass Bincombe Hill famed as THAT hill that The Grand Old Duke of York marched his 10,000 men up and down! Just off the path you can spot the medieval strip farming patterns easily here as well as yet another hill top fort at Chalbury. A slightly more recent attraction at Whitehorse Hill is the huge hillside chalk carving of George 3rd riding on his horse, the only white horse carving in the UK to have a passenger! You leave the South Dorset Ridgeway through pleasant trees, fields and chalk tracks to reach Osmington village on the Jordan River and a welcome jumble of pretty thatched cottages. Its here, that the painter John Constable spent his honeymoon and completed several works of art. A short walk below the village brings you back to rejoin the SouthWest Coast Path at Osmington Mills at Day 5 of the standard route description. CLICK HERE to return to the Dorset Coast Path Route Description from Osmington as it heads on towards Lulworth Cove. Overnight stops at the end of the South Dorset Ridgeway section of the South West Coast Path are at the coastal hamlet of Osmington Mills usually in the welcoming Smugglers Inn - If you have split the Ridgeway Route with a stop half way you will be able to continue today to the main overnight location further along the South West Coast Path at Lulworth Cove.